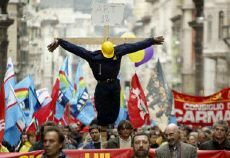 Protesters in Genoa carry a "crucified workman" during the general strike, April 16, 2002 (Photo: AFP). This was Italy’s first general strike in 20 years, and as such it was a “very political strike,” according to Giacomo Folli of Milan’s centrist Corriere della Sera (April 17). It was organized by Italy’s three major trade unions to protest the government’s plan to overhaul and weaken Article 18 of Italy’s rigid labor law so that employers would have greater freedom to hire and fire. Article 18, which was passed in 1970, states that a company with more than 15 employees must reinstate a worker if a court finds that he or she was fired without just cause. The unionists charge that any change to this established labor law---one of Europe’s most protective---would give the government a green light to further erode workers’ rights and job securities. Thirteen million Italian workers walked off their jobs, and 2 million took to the streets for a day, bringing the country to a standstill. Participants included, among others, transport, media, and health-care workers. The action was more than an expression of anger: It was the beginning of an organized opposition against Berlusconi. The left, at first paralyzed after the media tycoon’s stunning victory last June and formation of a rightist government, seems to have reclaimed its confidence to challenge the prime minister openly. Surely the strike also brought back painful memories for Berlusconi himself: Mass demonstrations helped bring down his first, shorter-lived government in 1994. The participation in the strike confirmed what many Italian commentators have long argued: That Sergio Cofferati, the leader of Italy’s largest trade union, the Confederatione Generale Italiana del Lavoro (CGIL), has the requisite support to run for office against Berlusconi. He has become the center of Italy’s labor movement, coordinating activities with Italy’s two other---more moderate---major trade unions, the Catholic Confederazione Italiana Sindacati Lavoratori (CISL), and the centrist Unione Italiana del Lavoro (UIL). Cofferati is a quiet man; Berlusconi refers to him dismissively as “Signor No.” But Berlusconi’s opponents welcomed Cofferati’s call for the unions to unite against Berlusconi’s government as the opposition’s first significant act of defiance since Berlusconi took office. Corriere della Sera, for example, in an April 15 front-page article, saw the general strike as “an instrument of political struggle,” which had nothing to do with the normal business of trade unions. Perhaps they would. But opposition to Berlusconi has been rapidly gaining steam in recent months. Smaller strikes have been an almost daily occurrence, but until recently did not have much impact. And even now, the political opposition is too divided to pose a serious threat. But if Italy’s press is any indication, that may soon change. Milan’s weekly Diario della Settimana regularly refers to Berlusconi as “the one who buys everything;” Rome’s left-wing Il Manifesto has called him “the elegant evil,” and “the black knight.” And when the unions called for a general strike, Italians across the political spectrum were happy to comply. Perhaps it was to keep terrorists from hijacking their agenda. On March 19, Marco Biagi, a consultant to the government on labor law who had worked to change Article 18, was gunned down as he bicycled home from work. An offshoot of the Red Brigade, a far-left terrorist group active in the 1970s and 1980s, claimed responsibility, but Berlusconi’s coalition partners blamed the murder on the intransigence of the labor unions. On March 27, after Cofferati---whom Italian newspapers call the “anti-premier” or the “anti-Berlusconi”---organized a rally in Rome that drew 2 million people, expressing disgust at the murder but protesting proposed changes to Italy’s labor law. The turnout at this first rally may well have inspired Cofferati to build on his success. Unions and the government are now set for long and painful negotiations in search of a compromise. Even a complete remake of the political arena is now possible, but the unions are going to have to take risks---cautiously. “Cofferati is aware of the fact that a general strike can be employed only once,” Gianfranco Fini, Italy’s Vice Premier and leader of the far-right National Alliance Party said, as quoted in Berlin’s left-wing taz (April 18). “He knows that he can’t threaten to strike again in another month.” Nevertheless, the opposition is slowly attempting to unify Italy’s three major trade unions into one potent political front that will vote together.